Kenyans on Saturday commemorated the first anniversary of a terrorist attack that killed 148 people, mostly students, at a university in Garissa in the country's worst massacre since 1998. 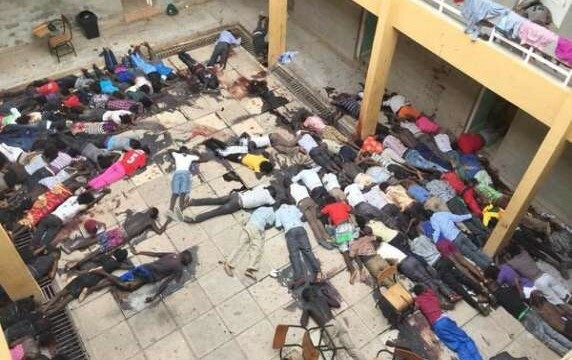 Four gunmen from the Shebab, al-Qaeda's East Africa branch, raided Garissa University College on April 2 last year, shooting students dead in their dormitories and then rounding up and executing scores more in a hall of residence. It was the worst terrorist attack to hit Kenya since al-Qaeda bombed the US embassy in Nairobi in 1998, killing 213 people. On Saturday, a group of about 100 people wearing T-shirts with peace slogans gathered in Garissa, 365km northeast of the capital Nairobi, to participate in a run in honour of the victims. "We stand with the parents, we want to tell them that together as a country, from the north to the south, west to east, Muslims and Christians... together we must fight terror," said Garissa MP Aden Duale, who took part in the run. Wheelchair-bound Farah Ali, a Garissa resident, pushed himself along the 5km course to show "strength in solidarity" with the victims. Other remembrance ceremonies were held in dozens of schools and universities across Kenya, including in the central town of Eldoret where hundreds of attack survivors relocated to continue their studies. Garissa university reopened in January but few of the former students were willing to return. Prayers and candlelight vigils were due to be held later in the day in Garissa and Nairobi, led by government officials. Government involvement in the anniversary commemorations contrast starkly with the days following the attack itself when it was left to ordinary folk to organise memorial vigils. The security response to Garissa was - as during an assault on Nairobi's Westgate mall in 2013 - strongly criticised by many Kenyans. It took 16 hours for a special anti-terror unit to bring the attack to an end, with their deployment slowed by a senior police officer who had commandeered the force plane for a family excursion. As with Westgate, there has been no public enquiry into what went wrong. Kenya has suffered at the hands of Shebaab since sending troops into neighbouring Somalia to fight the jihadists in 2011. Terrorist attacks have been frequent and deadly while in Somalia, Kenyan soldiers have been killed and their commanders accused of war profiteering through involvement in charcoal and sugar smuggling. In January, Kenya suffered what is thought to be its worst-ever military loss when an army outpost in southern Somalia was overrun by Shebaab fighters. Some estimate that as many as 180 soldiers died in the El-Adde raid, but the government has so far refused to give any numbers or name the dead.